If the bill you receive doesn’t have an itemized list for all of the services and medication, then request one to be sent to you. Once you receive it, go through the breakdown line by line and make sure that you received all of the medications and/or treatments listed. Make sure to also check the units and quantities to verify that you aren’t being billed for something twice that you only received one of. When you open your medical bills, check to see that your name, address, and insurance information is all correct. Just having one number wrong can affect the insurance claim. Another thing to do is to make sure that the billing company did indeed run it through your insurance. I received a bill for over $500 one time and saw that they didn’t even run it through my insurance. When I called the office and told them to run it, my bill was only $20. Every medical procedure has a billing code to help tell the insurance company what was done. If you were denied for a claim, you may want to double check the code. You can go to a site like findacode.com to verify that you did in fact receive that procedure. If there is an error you can call the office and let them know they need to code it correctly and resend it to your insurance company. After you have done all of the above, you may still owe a large amount that will be difficult to afford. One option is to go to healthcarebluebook.com to see if you were charged a reasonable price for your procedure. This can help give you a negotiating starting point. You can also see if the office will work with you on a payment plan or offer a lower lump sum cost. One of the easiest things to do to save on your next medical visit is to make sure you are seeing a provider in your network. Knowing your network is essential to lowering your out of pocket costs. Be up front with your doctor about your financial situation. If they know you are on a budget, they may be able to offer more affordable treatment options and prescribe generic medication. Another good idea is to take a notebook with you and write down everything that you had done during your visit. When the itemized bill comes, you can easily compare to make sure everything is correct. You can also record the visit on your phone if that is easier. 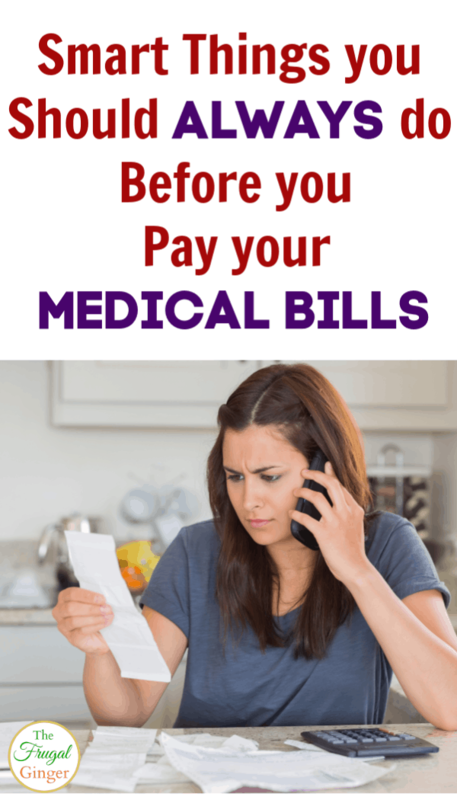 Medical bills have become a part of life, especially the older we get. Know how to protect yourself and your finances from billing mistakes. These are great tips! Getting an itemized list is important. Sometimes I get separate bills for one visit and that makes things so confusing!